A classic derby style shoe, crafted on a square toe last. By comparison to an 'Oxford' style, the 'Derby' style features an open lacing section, where the lace-flaps are not fixed to the vamp and therefore allow more height adjustment. It features a padded collar for added comfort, with tramline stitching detail. 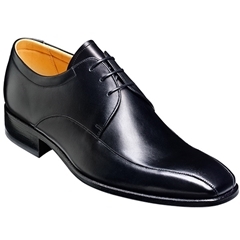 A professional shoe to team up with your formalwear.